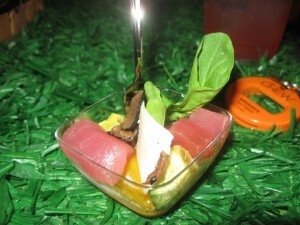 LatinoFoodie Nation, this will be the first of three posts recapping the LA Times/Food & Wine’s The Taste. It was just a lot to digest. 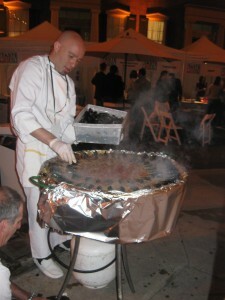 The Taste took place over four days during the Labor Day weekend: nine events in three locations. This was my first Taste and I was determined to go to every single event. I won’t hold you in suspense, so I’ll tell you that my pansa and I only made it through three events…barely. After walking halfway around Paramount Studios trying to find the right entrance gate (none of the security guards knew where to direct us), we finally were detained at fire gate 2 but still refused entry. At least we built up an appetite from the walk. The growing line of event attendees flashing their media credentials and tickets grew behind us. Our disappointment lifted as we were the first to enter through fire gate 2. Power walking back to the main gate, we finally made our way down the short red carpet, sans paparazzi. What? It’s LA and this was my first red carpet. Once I got over the less-than-thrill of the red carpet, I let the sights, sounds, and smells of the food booths baste my senses and consume me. 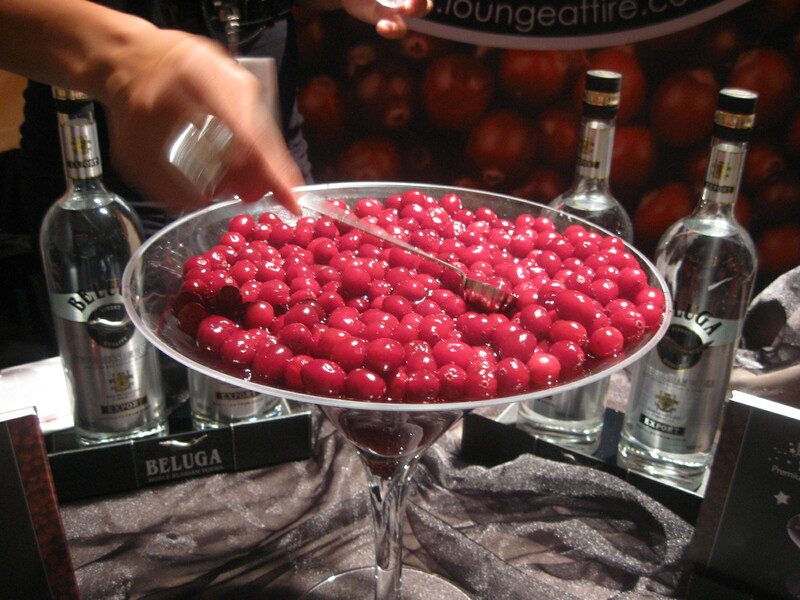 After blowing through Larsen’s delicious creamed spinach with steak (which honestly was a tad dry) and Wurstkuches’ Mango Jalapeno Sausage with caramelized onions & whole grain mustard, we washed our first tastes down with Beluga Vodka with Lounge Attire’s Premium Cocktail Cranberries. These tasty little cranberries are non-alcoholic but make a perfect garnish for cocktails. Don’t forget the holidays are just around the corner. Place the cranberries in an oversized martini glass, fill with vodka for a perfect, intoxicating bar centerpiece. M Café was my first “great taste” of the evening: Tuna Tataki with Daikon sprouts and pickled lotus root with a wasabi mayo served with sweet potato fries. Takaki means “pounded” or “hit into pieces,” in addition to being citrus-soy marinated and seared rare. The wasabi mayo took some getting used to (I’m not a fan of mayo) but embraced it as a great dipping sauce for the fries. M Café serves up contemporary macrobiotic cuisine, which used to be enough to scare me away, but with the “farm-to-table” and “localvore” movements sweeping the world, “using only the finest ingredients without any refined sugars, eggs, dairy, red meat or poultry” doesn’t seem so scary to this carnivore. 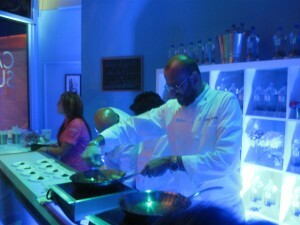 We waded through aguas frescas in the Hoy Cafe, cocktails from Wild Turkey, and the new Absolut Orient Apple Vodka to get to the demonstrations featuring food & cocktails from three VIPs in the restaurant scene. Chef Ricardo Zarate of Mo-Chica & Picca, who also won Food & Wine’s Best New Chef in America, Chef Jon Rivera Sedlar of Rivera & Playa, and master Mixologist Julian Cox. I did take video if Julian Cox mixing up two cocktails that you don’t want to miss so check back for the video I took of Julian Cox. While not the best quality (after 5 mini cocktails I was already exhibiting less-than-sturdy camera shots & you can hear DJ Jason Bently’s music in the background) this video contains two amazing cocktail recipes from Julian Cox. At the very end Chef Sedlar announced to The Taste audience that he will be featuring menu items from his groundbreaking (circa 1986) restaurant Saint Estèphe. The Manhattan Beach restaurant claimed to be the birthplace of modern Southwestern cuisine. So through the month of September, guests can order from a special Saint Estèphe menu and taste a blast from the past with dishes like: Chile Relleno with Mushroom Duxelles, Salmon Painted Dessert, Red Chile Ravioli with Carne Adobada, and Blue Corn Crepes with Canela Ice Cream. Yum! 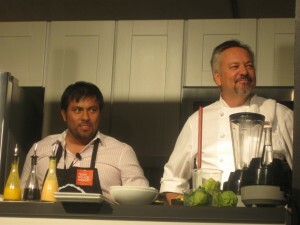 After three amazing demonstrations, LatinoFoodie was hungry for more. We headed to Eva Restaurant for some chicken liver pâté with a little mustard…and you know how I am about mustard. 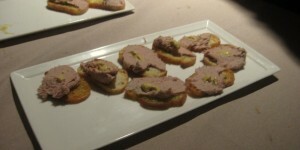 This pâté was definitely my 2nd great taste of the night. The picture doesn’t do it any justice. Stephen said he felt like Barbra Streisand in the movie Funny Girl who found out that chicken pâté was just mashed chicken livers on toast. In the movie Omar Shariff offers, “A bit of pâté?” Barbra says in her yiddish accent, “I drink it all day.” Stephen couldn’t stop going back for more pâté saying the line over and over again in his own refined Babs accent. Next door, Katana had a tuna sashimi with truffle oil & avocado. Lite and refreshing after eating a lot of toast point (so I made more than one trip to Eva). I slurped (not the most appetizing description, I know) down the little cup of tuna and went back for seconds. Even though the dish we had is not on their menu, as far as I can tell, they are local so check them out. From bulging bellies to blue lighting, we entered Alex Reznik’s booth, of La Seine, set up inside a store front on the studio lot. 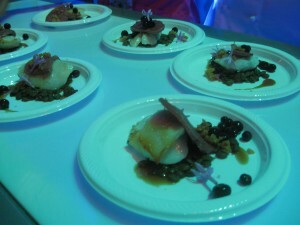 The blue lighting made it hard to see the masterpiece Chef Reznik placed before us: Halibut cheeks and beef tongue with huckleberries, chicken jus, and garlic blossoms served on a small bed of lentils. All these ingredients made this one of the more complex dishes I had at The Taste. Halibut cheeks and huckleberries are now a favorite of mine. I may have to change my “final meal” selection. Chef Reznik was my third pick for “great taste” for the night. We soldiered on through more food and made our way to the main stage where Mariachi El Bronx was getting ready to perform. I was munching down mojito and strawberry daiquiri cupcakes from Cake Mamas when I found myself transfixed by the band. The sweet dulcet notes coming from the speakers briefly eclipsed my munching, until I regained my senses and took in the music with the food offerings around me. The bands’ music is SoCal: punk & mariachi. We’re talking norteño, huasteka, corridos and more. Day one was coming to an end. After leaving the Hornito’s Bar, I found myself standing in line…a very long line. The crowd was excited and willing to wait for good food; I had to partake in whatever was at the end of this line. Halfway through the line I passed another booth and took some chocolate ice cream from Essential Chocolate Desserts and cleansed my palate with a cocktail. At the end of the line we were rewarded with paella from Bar Pintxo; the essence of the ocean with mussels & cod and the queen of spices, saffron. These guys were working head into the night because we didn’t happen upon them until near midnight. Well worth the wait. Joe Miller’s restaurant, Bar Pintxo, is located in Santa Monica so there’s no excuse for not experiencing good paella in LA. For those who dread the commute, here is the recipe. 1. Make the sofrito. Heat a 12-inch paella pan over medium-high heat. Add 3 tablespoons oil, then the onions and cook, stirring frequently, until the onions are softened, 3 to 5 minutes. Stir in the garlic and cook until fragrant, about 1 minute. Stir in the grated tomatoes and cook, stirring frequently, until the tomatoes have lost most of their moisture and the sofrito is reduced to about one-fourth cup, 8 to 10 minutes. Remove from heat and place the sofrito in a small bowl. Wipe the pan. 2. Return the pan to medium-high heat. When the pan is hot, add the remaining oil, then the cod and squid. Sear the fish, stirring frequently, about 1 minute. Reduce the heat to medium and add the sofrito back to the pan. Cook, stirring the sofrito with the fish to blend the flavors, for 3 minutes. Add the wine, stirring to remove any bits of flavoring from the bottom of the pan. Cook until the wine is reduced by half, about 1 minute. 3. Stir in the fish broth, then add the saffron and bay leaf. Season with the salt; the broth will be a bit salty at first, but will even out as the rice cooks. We had many other great bites but not great photos, sorry guys. The Jicama & carnitas taco was damn good. I don’t remember where it came from! The crispy, cool jicama was the perfect vehicle for a taco. Vici Victual also had some amazing mini sweet potato pie tarts. We finally threw in the towel and made our way home with grand designs to conquer the remaining events. Stay tuned for Part II of our Taste adventures with another article on Tacos and Tequila Tryst.